We loved our trip that The Travel Source arranged for us; after sending many visitors through them we finally were able to go ourselves, and were not in the slightest disappointed! 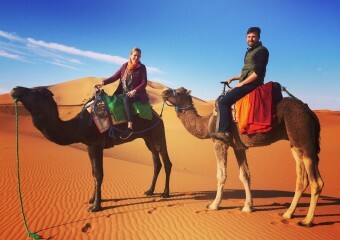 They coordinated everything and our experience at the riads, dars, and kazbahs was delightful. Everything worked like planned. We’d highly recommend The Travel Source for your Morocco adventures and getting to discover the beautiful corners of the real Morocco. When one of our group had a medical emergency they even went above and beyond in accommodating and adjusting our trip. High recommendation! Thank you Travel Source for a great Moroccan experience! A few weeks ago we traveled for ten days throughout the country with Jamal, the excellent English-speaking driver assigned to us. The riads and hotels where we stayed were wonderful. We felt very comfortable and safe with Jamal, who attended to our needs in a professional and friendly manner. Cold water bottles were always available in the late-model Mercedes van and Jamal was even able to arrange for wifi connection when driving for an extended period of time. Jamal, who himself explained much about the history and culture of his country while driving, also facilitated excellent English speaking guides for visits to selected cities and sites. 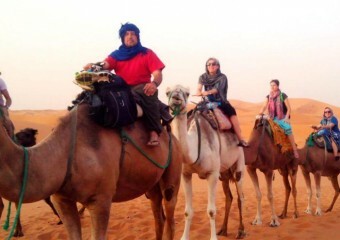 Jamal made our trip memorable by stopping to show us aspects of Morocco and its people seldom experienced by tourists. Jamal stopped when he saw a nomad woman and her children drawing water from a roadside desert well, while accompanied by their herd of camels! 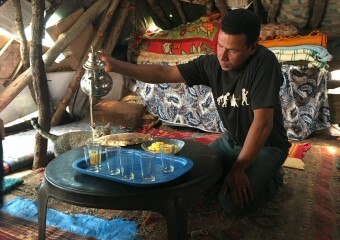 He took us to feed monkeys at a sanctuary in the Middle Atlas Mountains, and se stopped at the tent of a nomad family who graciously made us mint tea and scrambled eggs. Through Jamal, we experienced the beautiful people of Morocco in a way we never imagined would be possible! 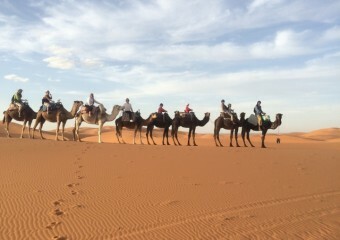 I, along with my daughter and two granddaughters just returned from a 10 day Moroccan tour with your company. We had such a good time. We saw many interesting sights and loved Morocco. We were so pleased with your travel company. I have already recommended your company to a friend who is booked to travel next month. The main reason I am writing is to tell you how much we loved our driver. Aissa was wonderful! We felt safe at all times and he took such good care of us. I’m sure I asked him a million questions and he answered them all with good humor. You are fortunate to have such a good man working for your company. Thank you for helping us have such a good travel experience. We hope to visit Morocco again! It is good to hear from you. I can’t really say that I am back home quite yet as I feel I haven’t left Morocco behind. I expect it will take a little (long) while for true reality to set in. We had an absolutely wonderful experience that met and far surpassed our expectations! Thank you so much for that. Everything went so smoothly and we felt relaxed, with no worries as we had complete confidence in Ilyass. You were right when you said he would be like family to us. Ilyass was a pleasure to get to know. He really enriched our trip by sharing information about his life, his family, fiancée, his country, life experiences and his point of view with us. He always had the answer to any questions we had along the way. Besides being a great friend he was a great tour guide. We learned so much through him. Ilyass also was very perceptive and diplomatic with regard to our possible limitations during any given time period as we went through our daily activities. Without actually saying so, he would adjust his plans for us as we went along so that we would enjoyably get the very most out of every day. We couldn’t ask for more personalization! Last night we arrived home from Andalusia, Spain where we spend the last 7 days with the Greenbergs. It was very nice to meet you at the Riad and see how much you care about your customers. Our time with Khalid was great…he is a very careful driver, very nice and knows the places very well. Your services from first email to the end where first class. The tour was very well organized and maybe it was our mistake to ask you for the stop on the way to Fes as it was the worst hotel and food. I would not recomend it to any of your customers. We would of course recomend your services to our Friends. You are a vey profesional Company. here in Fes and a great trip down to the Sahara with Ilyass. recommend The Travels Source and Ilyass to any friend visiting Morocco! Thanks for the great trip!! Jaimas Madu – It was hard to remember we were eating and sleeping in tents! We arrived after the sunset so our camel to camp was in the dark, which was (mostly) hysterical to stop of the side of the road and get on a camel with a stranger. We loved it. The dinner was one of our top meals in Morocco, and we were stuffed at the end of the meal. But not too stuffed to enjoy the music, company of the Berbers who worked there, and sky full of stars by the outdoor fire. My husband loved talking with the guys in the many languages they have acquired over the years. L’Ma Lodge – loved this place, ultimate luxury oasis! Can only imagine what it’s like in springtime with their beautiful gardens in full glory. Vanessa was sweet to upgrade us to a suite when she found out we were on our honeymoon. We enjoyed hearing the story of how she and her husband ended up in Morocco; the careful effort they put into the setting and food was A+. The entire experience was warm and welcoming. This year was perfect…part of this, THANKS TO YOU!!! I hope you and your family have a great holidays and I wish you a lot of nice things in the New Year!! My group, including me, are not very “wise” so that it’s why I didn’t sent you any details about the questions you sent me… I just said that we still remember the wonderful travel we did in all Morocco and the espectaculars persons we met, including of course you and the guide and the drivers. I also want to mention that we love the night at the Jaima, we think is something we will remember for ever, not only for the place, the sky, the stars, the dawn, the sand, the tent and of course the bedouins who attended, sang and were very kind with us…The desert is something you must live, touch, feel …it’s just amazing!!! Please don’t let anyone miss it!!! We really enjoyed our Morocco trip. It will be a family highlight for many years to come. So far several of us have already made pictures from there their Facebook profile. High lights were the FEZ madina. Brandon wanted to stay longer. The desert trip was awesome. Again we wanted to stay longer and climb dunes, We enjoyed the market in Marrakesh, The Grand mosque in Casa was great to see, especially inside. Our driver Hamid was perfect. He was not overbearing, but ready to answer questions and give timely history and facts about Morocco. Cant really say enough good about him. The airport transfers went well. No hangups and issues. We just bought to many souvenirs and were over weight leaving Casa and had to add an additional piece. But that’s not your problem. A good thing really. The quality hotels were better than we expected. The food was awesome, gained too much weight, again not your problem. We had an excellent time at Morocco and have been raving about the experiences with our friends and colleagues! As expected… the people were kind, well mannered and friendly. There is a national pride in them which clearly shows when they talk about their rich history, culture and cuisine….which they should be proud. The historic places are clean and well maintained. The highlights are plenty…many people mentioned that they love Bollywood movies and especially Shah Rukh Khan!! Our night in Sahara was unique experience as we never saw so many stars in our entire life. We took plenty of pictures of the breathtaking sunrise sitting on top of a sand dune. Your company and staff are well experienced and professional. We never felt pressurized as you were patient in addressing all our questions from the beginning. Our driver/guide Mr. Khalid is awesome. He is passionate about his job and it truly shows as he goes out of his way to make sure we had good time in Morocco. He knows his ways and well connected which made it simple and we did not waste any time. Since we are vegetarians, he made sure that he found us food in all the places we went. We already recommended your company to some of our friends who are interested in going to Morocco! All in all, we had a great time and thank you for making our trip a wonderful life experience! !